Click on the numbers below to move through the horses by page. 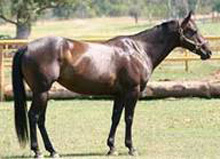 Black AQHA/TB Mare, 1999, 15.3 hands. Zeta has been used by youth and adults both western and English. She has shown at 26 and 29 winning champions in both divisions at MHJA shows and competed with a youth in the novice level Event winning third. 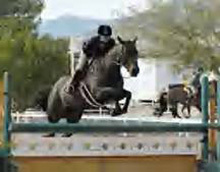 She did the 3 and 33 at Tuscon in training level eventing. Zeta has won money in Ranch roping and pole bending. She has competed in hunter/jumper, barrels, poles, ranch roping, reining, trail riding, and halter. Zeta has been used in a lesson program for beginners, on trail, and arena training. For more information and a video, call Karen Griffith (740)-992-5782. No matter where you are located, Karen can arrange affordable, convenient shipping to your farm.